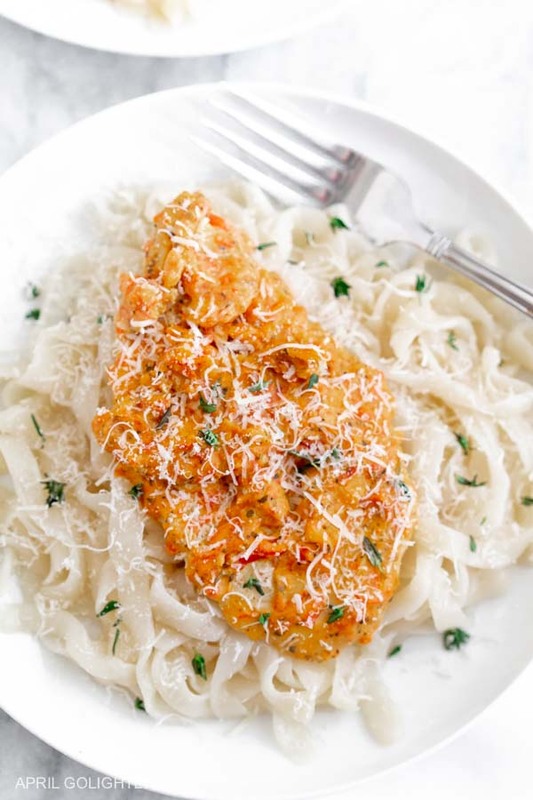 This tasty Keto Chicken with Roast Red Pepper Sauce is extremely tasty dinner choice for those looking for a flavorful low carb dish. My husband and I have working out and doing the Ketogentic Diet for the past few months. During that time, we have been cooking a lot. This is one of our favorite Keto Chicken recipes. As with most of our Keto chicken dishes, we buy chicken breasts and tenderize them so they are not tough or dry. I use the flat part of the tenderizer so that it does dot rip up the chicken. To keep the chicken from making a mess of the kitchen, I lay down a piece of saran wrap. Then, I lay the chicken on top. This chicken dish starts with fresh red bell pepper, Fresh from Florida. Getting fresh peppers that are in season is key to making the best Roasted Red Pepper Sauce. Did you know that Fresh From Florida bell peppers are now in season in Florida!? Florida Farmers make it easy for everyone to eat fresh produce year-round. To find local produce, just look for food, produce, seafood, and especially bell peppers labeled Fresh From Florida. Check out more Fresh from Florida peppers recipes here. This easy Keto chicken recipe is part of a low carb easy meal plan because it can me made quickly in the oven on a baking sheet. When you are on the keto diet meal planning helps you lose weight quicker so that you are not tempted by carbs. 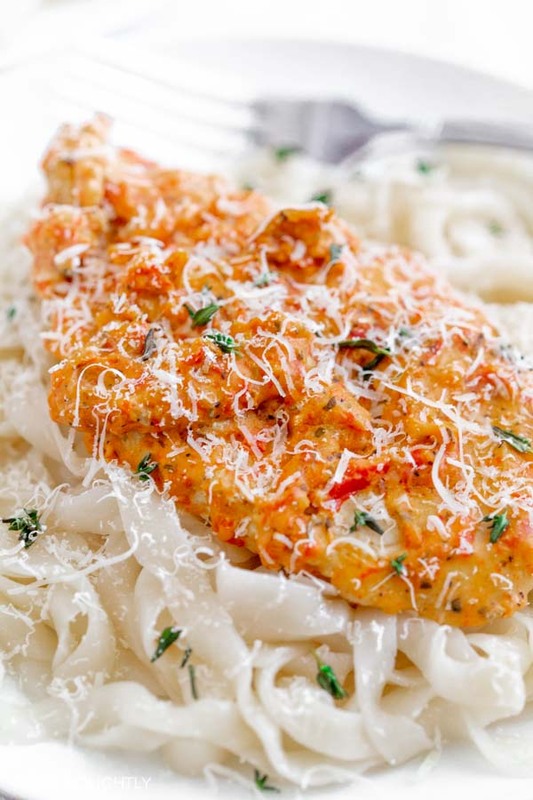 In short, your comfort food craving will be satisfied by this Chicken Breast with Roasted Red Pepper Sauce over Zero Pasta. This Balsamic Chicken dinner is the perfect dinner for warm weather. Spice up your chicken and zoodles with this Almond Pesto. How to Roast Red Bell Peppers? Instead of using a jar of roasted red pepper, you can roast your own fresh red peppers. Firstly, start by roasting the red bell pepper in the oven. Next, turn on the broiler on your oven. Cut the top off each pepper and pull out the seeds. Discard the seeds and the top. After that, cut the peppers in half, and lay skin side up on a baking sheet lined with foil. Broil until skins are black which should take about 10 minutes. Finally, put the peppers in a bowl and cover for about 10 minutes to make it easier to take off the skin. Remove the skin. How to Make Roasted Red Pepper Sauce? Combine roasted red peppers, 1/2 teaspoon Italian seasoning, avocado oil, 1/2 teaspoon garlic, 1/2 teaspoon salt, and 1/4 teaspoon black pepper in a food processor or blender pulsing until smooth. How to Make Keto Chicken? You can slice the chicken breast in half lengthwise making the breasts into cutlets or you can pound the two chicken breast very thin between two pieces of saran wrap. Either way, for tender chicken breasts, place the chicken between two pieces of saran wrap. Use the flat part of the meat tenderizer to pound the chicken flat. Use the avocado oil to grease a large skillet. Season chicken with remaining 1/2 teaspoon Italian seasoning. Cook chicken in the skillet over medium heat for 6 minutes on each side until cooked thoroughly and lightly browned on the outside. Transfer to a plate and cover to keep them warm. Add the red pepper mixture to the pan and stir over medium heat 3 minutes until hot. Then, add in the heavy cream and stir until creamy and combined to the desired consistency. Add chicken and toss in the creamy sauce to coat. Remove the chicken from the pan and plate over pasta. Garnish with cheese and fresh basil and serve. Start by roasting the red pepper in the oven. Turn on the broiler on your oven. Cut the top off each pepper, and pull out the seeds. Discard the seeds and the top. Cut the peppers in half, and lay skin side up on a baking sheet lined with foil. Put the peppers in a bowl and cover for about 10 minutes to make it easier to take off the skin. Remove the skin. Combine roasted red peppers, 1/2 teaspoon Italian seasoning, avocado oil, 1/2 teaspoon garlic, 1/2 teaspoon salt, and 1/4 teaspoon black pepper in a food processor or blender Pulse until smooth. Slice the chicken in half lengthwise making the breasts into cutlets. Place the chicken between two pieces of saran wrap. Use the flat part of the meat tenderizer to pound the chicken flat. Then, add in the heavy cream and stir until creamy and combined. Add chicken and toss in the sauce to coat. Here are some more dinner recipe that you will love! Try this tasty Chicken Francese recipe. You can make it Keto by using Almond Flour. One of my favorite Italian Chicken recipe is this Chicken Milanese. Do you love Indian? This One Pot Chicken Tikka Masala will make you smile. Make your favorite Italian Chicken recipe in the Crockpot – Chicken Marsala. Don’t forget to follow the Fresh from Florida on social media and check out their Fresh! recipe videos. This looks super yummy! Thanks for sharing this keto recipe. This look so good! Cna’t wait to try this tasty chicken recipe!